Scientists have long known that molecules dance about as the temperature rises, but now researchers know the exact steps that water takes with a certain molecule. Results with small, electrically charged cyanide ions and water molecules reveal that water zips around ions to a greater extent than expected. The findings improve our understanding of a chemical interaction important in atmospheric sciences. "One of the cornerstones of Department of Energy climate research is a fundamental understanding of water and ions, one of the most common chemical interactions," said chemist Xue-Bin Wang of the Pacific Northwest National Laboratory and Washington State University. "We've developed a new instrument to probe the dynamics of ions in water," Wang said. "And we've combined theory and modeling to make sense of those experiments, giving us a deeper fundamental understanding of what is happening with this ubiquitous molecule - water." 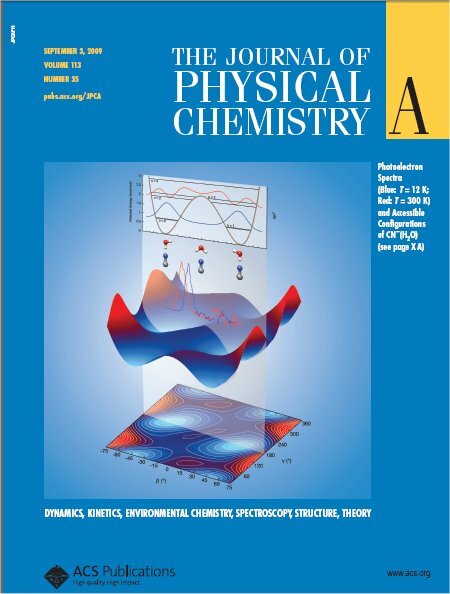 Wang, PNNL physical chemist Sotiris S. Xantheas, physical chemist Lai-Sheng Wang of PNNL and WSU, and their colleagues published the results in the Journal of Physical Chemistry A. The journal featured their work on the cover of its September 3 issue. Thirst for Details: Atmospheric scientists want to know how small particles flutter through water vapor in the sky. To get at the basics, they study a simpler interaction: water and ions, small atoms or molecules that have a slight electrical charge and exist everywhere in nature. For example, when common table salt—sodium chloride—dissolves in water, the negatively charged chloride ions (Cl-) and the positively charged sodium ions (Na+) each interact separately with the water molecules. But directly observing temperature's role in how water and cyanide ions interact has been difficult. So, the team developed a unique instrument that allowed them to precisely control the temperature down to almost absolute zero, or the temperature at which everything freezes. The team used temperature-controlled photoelectron spectroscopy in EMSL, the DOE's Environmental Molecular Sciences Laboratory on the PNNL campus, to determine how tightly one cyanide ion and one to three water molecules interact at the very low temperature of -438 °F (12 Kelvin) and again at ambient temperature of 80 °F (equivalent to 300 Kelvin). Unexplained Energy: The team measured the molecules' electron binding energy at low and high temperatures. This energy is an indication of how tightly the molecules hold onto their electrons—the tighter the hold, the stronger the bonds that will form between molecules. The team found that ones at low temperature exhibited higher electron binding energy than the ones at high temperatures, as they had expected. However, the difference between the two scenarios was greater than the team expected. The team found that the molecules behaved differently at cold and warm temperatures. At lower temperatures, the boomerang-shaped water held still while the cyanide teetered at the end of one of water's two arms. There, the cyanide flipped, sometimes pointing its carbon (C) atom towards the water's arm, and sometimes pointing its nitrogen (N). At the coldest temperature tested, -438 °F, the molecules froze, with cyanide pointing its nitrogen end at the water. Hot to Trot: At ambient temperatures, however, the barbell-shaped cyanide held steady while the water molecule rocked and flipped around the cyanide. Although the researchers were surprised at how much the water moved, the many positions water could take explained why they saw less electron binding energy than they expected at room temperature: A wiggly water means that the bond between molecules isn't that tight. What's Next? The researchers plan to follow up with studies that include many water molecules and ions at once, as well as with more complex ions than cyanide. Acknowledgments: The research was done by Xue-Bin Wang and Lai-Sheng Wang from Washington State University and PNNL, and Karol Kowalski and Sotiris Xantheas at PNNL, along with Alfred Lauberau and Jasper Werhahn from the Technical University of Munich at Garching. EMSL resources including the Chinook supercomputer were used. Sponsor: DOE's Office of Basic Energy Sciences within the Office of Science. Reference: Wang XB, JC Werhahn, LS Wang, K Kowalski, A Laubereau, and SS Xantheas. 2009. "Observation of a Remarkable Temperature Effect in the Hydrogen Bonding Structure and Dynamics of the CN-(H2O) Cluster." Journal of Physical Chemistry A, DOI 10.1021/jp9034002.